First things first, how did I gather this data and how will I use it? This was not done comprehensively, or with any particular control to ensure the randomness of the order. While the polls all had a time duration of an hour, the Half-Orc race was accidentally given a duration of a day. The list wasn’t comprehensive! I left out the Dwarf and Gnome entirely, and didn’t include the Githzerai despite meaning to. Time was a factor. The first post of the thread had already run out of time by the time the last post was posted. 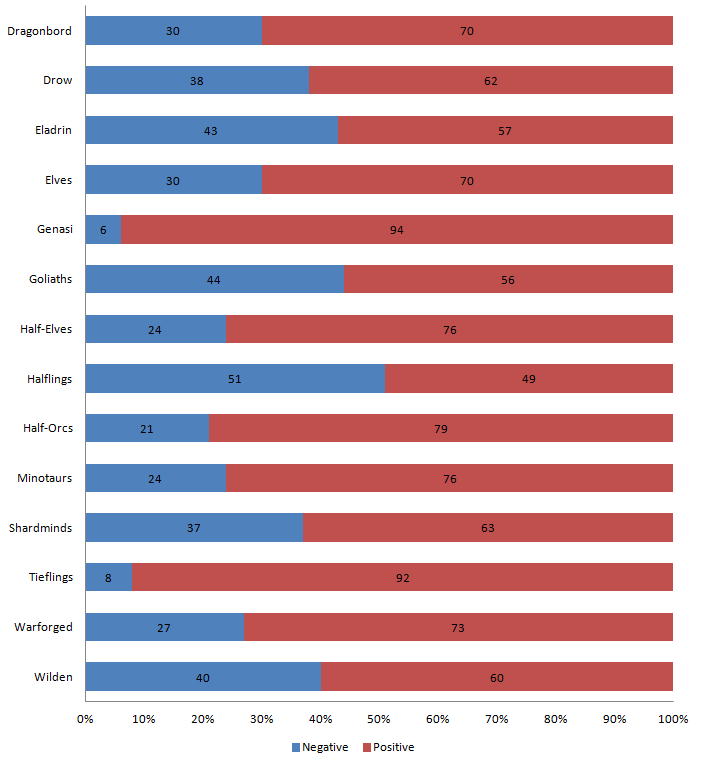 There’s a certain amount of ‘thread fatigue’ – Drow, the last posted entry, had only 27 responses, and Half-Orcs, slightly higher, had only 19 at the time of this, compared to 72 of the first poll. I completely mixed up the name of Genasi and Githzerai, and so the Genasi votes were phrased as if appealing to the Genasi, clouding that data. Based on the four categories of votes, Halflings are the most likely to receive a Very No vote, Goliaths a no vote, Genasi a Yes vote, and Tieflings the most likely to receive a Very Yes note. So popular are Tieflings, in fact, that their Very Yes votes are almost a third again as common as the next-highest Very Yes, the Shardmind. 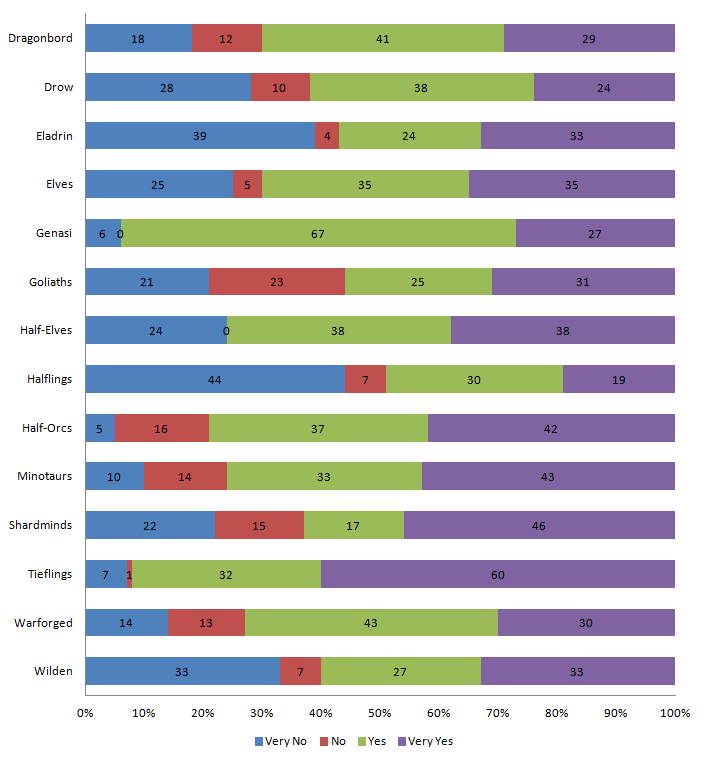 This data makes it clear how extremely popular both the Tiefling and the Genasi are – Genasi, amazingly, outpace the Tiefling, though their data is, as mentioned above, slightly corrupted. It’s remarkable only in that the Tiefling already represents an enormously positive response, so that they aren’t the lone outlier is surprising. While we can point to a general positive trend amongst these races, what seems the most interesting to me is that only the halflings – who are largely very human – had a less than 50% Positive response. 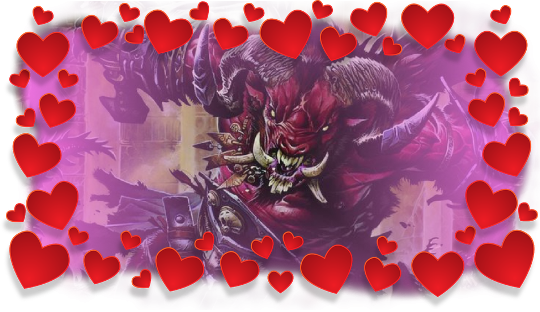 This may be a limit of the methodology – people may think halflings are great, but they don’t want to smooch them. And now with this shown, here’s the data broken down two ways. The first is to simply represent the votes cast, and the second is to break those into positive vs negative. Note the typo in ‘dragonborn’ is only in my data set, not in the original tweet. This breakdown is sorted by alphabetical order, not by any kind of quality.